I hadn't intended to write about this but so many people have asked me about what it was like to be on a cruise ship during Hurricane Sandy, I thought I would put aside what I had planned on writing about this week and instead put together a cruise review of my voyage on Caribbean Princess. The cruise was scheduled to be a short four day cruise including a day in Bermuda. Having sailed on Caribbean Princess several times before, I knew that she provided a good cruise experience. Bermuda is one of my favorite cruise destinations. Friends were going on the cruise so it looked quite attractive. I must admit that I experienced some trepidation as reports of a hurricane coming up the Atlantic coast dominated the media in the days before the ship was scheduled to embark from New York. I have been in a hurricane on a passenger ship and it is not the most comfortable place to be. Still, I had faith that Princess would somehow keep us safe and relatively comfortable. My faith turned out to be justified. Princess did keep us safe. We didn't get to Bermuda but they managed to provide a good onboard experience in rather trying circumstances. There was some tension aboard. People were worried about friends, families and property at home. Also, with the closure of the Port of New York, there was uncertainty about when and where this cruise would end. Some passengers chose to take their anger out on Princess - - the closest authority figure. I overheard one passenger who, although he said he was not a lawyer, was orating about various legal strategies passengers could pursue. Having practiced law for 20 years, I saw no merit to what he was saying. But he was probably just venting frustration. When I returned to New York, I found out just how lucky I had been to have been on Caribbean Princess. There was no electricity and no heat for a week after the storm and in the icy cold, I longed to be back on the warm ship. I sustained some property damage but it was nothing compared to the damage and injury that occurred elsewhere in the vicinity. Thus, I felt very thankful that I had been away. My account of my experiences is posted at http://www.beyondships2.com/caribbean-princess-shelter-from-the-storm.html. On a lighter note, I have also included dining reviews of the afternoon tea http://www.beyondships2.com/caribbean-princess-aternoon-tea.html and the pub lunch on Caribbean Princess. http://www.beyondships2.com/caribbean-princess-pub-lunch.html These are additional dining events designed to enhance the onbaord experience. 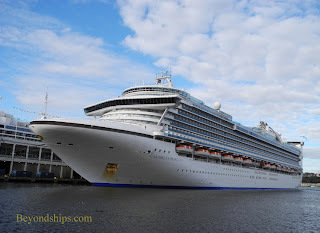 I have also added new menus http://www.beyondships2.com/caribbean-princess-menus.html and daily programs http://www.beyondships2.com/caribbean-princess-daily-programs.html to Beyondship's existing profile of Caribbean Princess.